I am a great believer in being yourself, life is so much simpler when you are. It starts with knowing who you are and being happy with that. But it can be tricky at times and can be even harder in the work place. I know this from my own experience at the Environment Agency. As a senior executive in a very visible leadership role, I carved out a successful career and outwardly I appeared entirely content and happy. Almost everyone who knew me at work also knew me as a happily married straight man with two children. But when I looked at myself in the mirror this is not what I saw staring back at me. Years passed, and I became very good at pretending to myself and those around me that I wasn't who I was. But doing this came at a cost. It's difficult to articulate, but I can only liken it to carrying an awkward and increasingly heavy weight. Every time you evade a question, every time you don't tell the truth, every time you deny your true feelings, this weight gets heavier and more awkward. And for me it also started to eat away at my ability to feel I had any licence to lead people. I felt increasingly inauthentic, as though not being myself meant I had no right to ask anyone to follow me. I was not being myself. I woke up one day and realised I had one shot at life and I didn't want to look back at the end of my days with regret that I led a life congested by fundamental unhappiness. From this moment on I started my coming out trip. It took me a while, but I got there in the end. And when I made the last big step and came out very publicly during a conference speech at work - it was as if the weight I'd been carrying just vanished in a moment. Someone actually remarked how I almost stood visibly taller after I'd finished speaking. All I remember was a feeling of the most overwhelming relief. It signalled an ending, but, more significantly, a beginning. Now several years on I am the most content human being on earth, as my partner Jack would tell you. Sure I have troubles like everyone else. But I am me and I am happy. And that, I have learnt, is everything. So I can understand the personal challenges one needs to overcome, but boy is it worth it. That’s why I feel strongly about adding my support to National Coming Out Day. Not only can it act as a catalyst to help LGBT people live their best life and to be themselves. It can support others who are going on their own journey. It matters. At the Environment Agency we believe in this. We want our staff to be themselves at work. We want our workplace to be a life enhancing experience. This means happier staff; which leads to greater motivation and a stronger culture. Happier people tend to solve problems faster, more collaboratively and more creatively. Our own LGBT Network drives this forward and is now 12 years old. It provides support to LGBT staff and challenges the organisation to improve awareness and inclusion of everyone. We want all our staff, whatever their sexual orientation or gender identity, to feel able to be themselves in their workplace. We are proud to be a member of Stonewall's Diversity Champions programme and for the tenth successive year the Environment Agency has be ranked as a Stonewall Top 100 Employer. 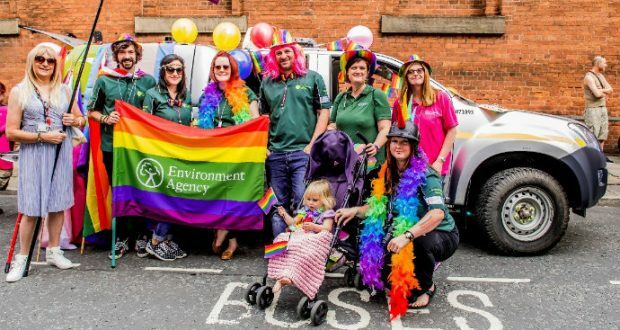 Our aspiration is that everyone at the Environment Agency has an equal opportunity to be happy at work, and most importantly, to be themselves.